The Professional Postgraduate Certificate and Diploma courses in Dyslexia and Literacy are a unique and prestigious programme at Master’s level 7 that provides the training for qualified teachers to become informed practitioners and specialist teachers and/or assessors. The courses are modular and flexible and are undertaken part-time, through online learning. What does the programme provide? Candidates will need to be able to balance the demands of their studies with existing work and home commitments in order to benefit from the modules and gain the qualifications on offer. Candidates who are unable to commit to the demanding course schedule may like to consider enrolling on our Level 5 specialist teacher training CPD pathway and programme. This Certificate course is for those who wish to study at Master’s level to become a specialist teacher of dyslexia/SpLD and gain university credits. The course comprises three modules (A, B and C – 12 weeks/one term per module) which explore current research in dyslexia and co-occurring difficulties; the principles and practice of the psychometric assessment process and the theoretical framework that informs the effective support of learners with dyslexia and/or other literacy difficulties. All practitioners train using the Dyslexia Action Literacy Programme (DALP). The Certificate in Assessment Practice for Dyslexia and Literacy is only available to those individuals who already hold a Specialist SpLD Teaching Qualification such as the Dyslexia Action Level 7 Postgraduate Certificate in Structured Teaching Intervention, Level 5 Diploma in Strategic Teaching Support for Dyslexia and Literacy, OCR Level 5/7 (with ATS) or other BDA accredited courses. This Certificate comprises a bridging module plus three modules (B, D and E – 12 weeks/one term per module). This course follows on from the Postgraduate Certificate in Structured Teaching Intervention for Dyslexia and Literacy (which must be taken first) and comprises a further three modules (D, E and F – 12 weeks/one term per module) which enables the practitioner to qualify as a specialist assessor of dyslexia/SpLD. To gain the full MEd Professional Practice in Dyslexia and Literacy, you must complete 180 credits at level 7 (masters level). Having completed the 120 credits from Learning Phase 1, you will be ready to complete the final 60-credit module with Real Training. For more details about this, please see the MEd Professional Practice in Dyslexia and Literacy page on the Real Training website. This route is only available to individuals who already hold a Specialist SpLD Teaching/Practitioner Qualification (such as the Dyslexia Action Certificate in Structured Teaching Intervention) at Level 5 or Level 7. Candidates should have completed Modules A, B & C or equivalent. The Postgraduate Level programmes delivered by Dyslexia Action Training can lead to the award of credit points, as indicated, by Middlesex University. 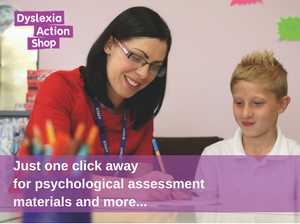 The Dyslexia Action Professional Programme is also accredited by the British Dyslexia Association (BDA) for specialist teachers and the SpLD Assessment Standards Committee (SASC) for specialist Teacher Assessors. All programmes are also eligible for membership of The Dyslexia Guild. Fees are payable by module, one at a time, and must be paid in full before the start of the module or you will be referred to the next available date. Fees include Student Membership of The Dyslexia Guild while the participant is actively studying on a three-module programme and for the first year of the programme only. Please ensure you download and read the information in the Downloads section before applying.